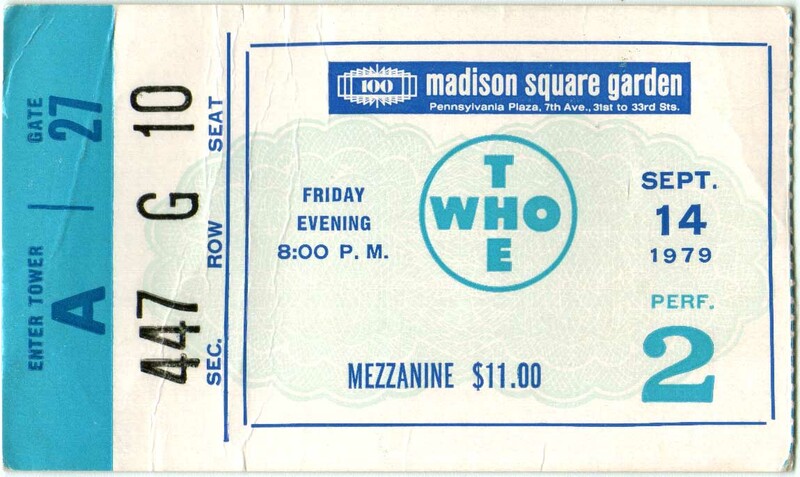 I have had the privilege of seeing the Who a number of times through the years. On the following list of shows I've been to if there is a hypertext link it will show you the ticket stub. August 30, 1967 - Rochester, New York - Followed the Blues Magoos and warmed up for Herman's Hermits. 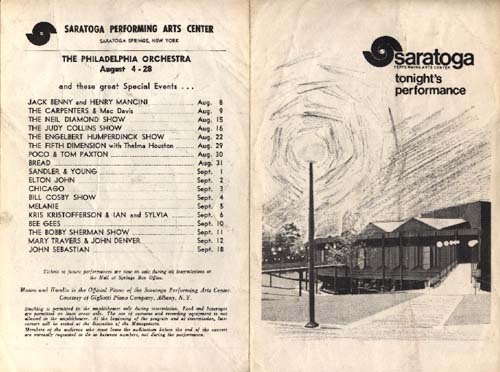 August 2, 1971 - Saratoga Performing Arts Center, Saratoga Springs, New York. Warmup act was Mylon. (I don't have the program but would like to buy one if anyone has one for sale). Front/Back. 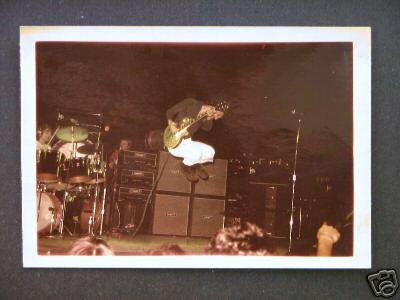 December 2, 1973 - Montreal Forum, Montreal, Quebec. Warmup act was Lynyrd Skynyrd. 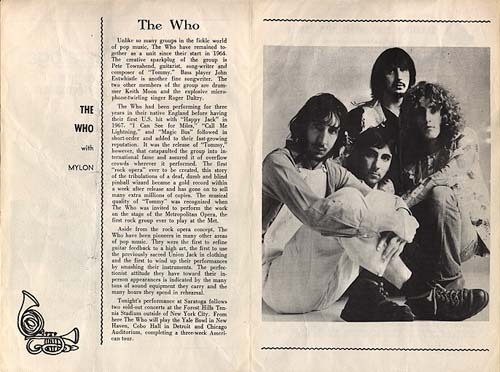 John Entwistle wrote the song "Cell Number 7" after spending a night in jail after this show. 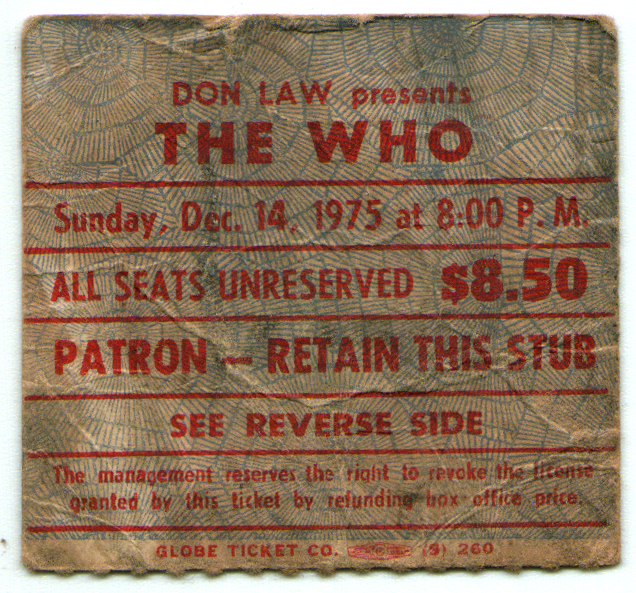 December 14, 1975 - Springfield Civic Center, Springfield, Massachusetts. Warmup act was reggae group Toots and the Maytalls. September 14, 1979 - Madison Square Garden, New York, New York. 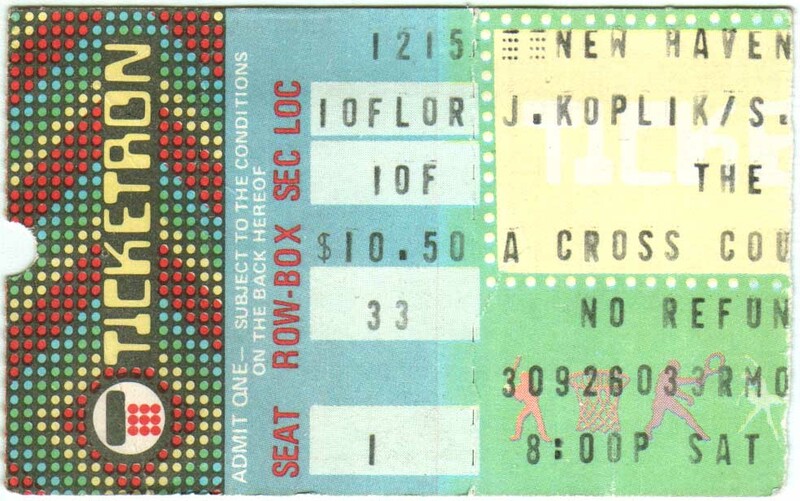 December 15, 1979 - New Haven Coliseum, New Haven, Connecticut. 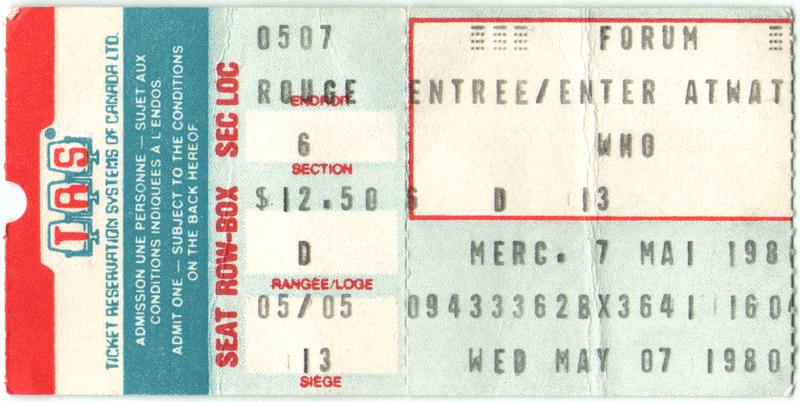 May 7, 1980 - Montreal Forum, Montreal, Quebec. September 25, 1982 - John F. Kennedy Stadium, Philadelphia, Pennsylvania. Opening acts were the Hooters, Santana and the Clash. 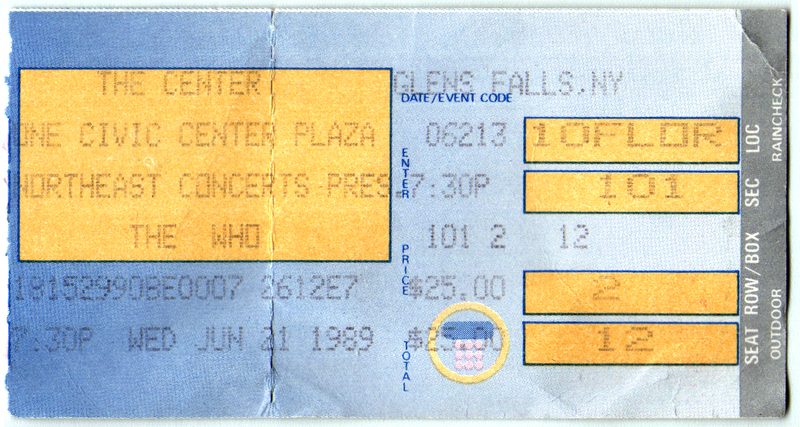 June 21, 1989 - Glens Falls Civic Center, Glens Falls, New York. The band spent two weeks only two miles from my home rehearsing for the 1989 tour. The first show of the tour was at our Civic Center, where I had second row seats on Pete's side. November 18, 1996 - Knickerbocker Arena, Albany, New York. Click here for show review. October 6, 2000 - Madison Square Garden, New York, New York. October 24, 2008 - TD Banknorth Garden, Boston, Massachusetts. February 24, 2013 - Verizon Wireless Center, Manchester, New Hampshire. May 24, 2015 - Mohegan Sun, Uncasville, Connecticut. I personally was not fortunate enough to have attended the following show. 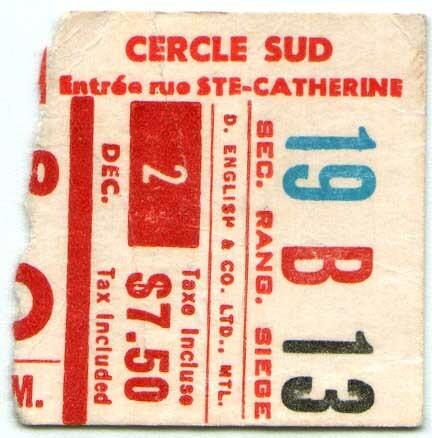 However, my friend Roland Boisjoly did and allowed me to scan an unused ticket he has. October 10, 1969 - Commonwealth Armory, Boston, Massachusetts. Full tickets I own or scans of copies I come across.